Online review websites are one of the best lead generation tools for restaurants. But only if your restaurant has plenty of great reviews. Get listed as one of the highest-rated restaurants in your area and you can expect a flood of visitors. Suffer from a string of poor reviews and you can forget about having a full house. Like ’em or hate ’em, restaurant review sites have become a major part of the restaurant industry. It is absolutely crucial for restaurateurs to be encouraging customers to review their restaurant and actively monitoring (and responding to) what customers have to say. There are dozens more review websites out there. Other blog posts will list ten sites that you should be monitoring but we focus on the top 4 sites every restaurant must monitor and manage. Why You Need to Manage Reviews For Your Restaurant? Harvard Business School found that a one-star increase in your Yelp rating can lead to a nine percent increase in revenue. A report in the Economic Journal found that an increase of half a star on Yelp meant a restaurant was much more likely to be full at peak times. In a BrightLocal survey, 60% reported reading a review for a restaurant before they went. Based on the available research, a couple of things should be immediately clear to restaurant owners. Reviews for your restaurant on Yelp and Google are going to happen whether you like it or not. People are going to read these reviews whether you like it or not. And people are going to make a decision to come to your restaurant based on these reviews whether you like it or not. This means restaurant owners have a simple choice. They can either hide their heads in the sand and pray that there are no negative reviews. Or they can actively monitor the reviews on these websites and respond to each review, whether good or bad, in order to encourage better reviews and show that they care what their customers think. Responding to negative reviews in the right way can even persuade some customers to change their mind and upgrade their review. In cases where the customer is actually in the wrong, restaurant owners can point this out to potential customers reading the reviews. Most people will give you the benefit of the doubt, especially if the review sounds petty. But they won’t know this unless you respond and give your side of the story. It’s always better to be part of the conversation, even if you think the conversation is unfair at times. Engaging with customers, encouraging more reviews and pointing out ridiculous reviews aren’t the only benefits of actively monitoring your restaurant’s reputation on these sites. They also provide a way for you to get feedback on what the customer experience is really like in your restaurant. As a busy manager, it can be hard to notice everything that goes on. You may miss an employee, a dish or a process that has a negative impact on the customer experience. The reviews are a great way to quickly get an idea of how customers perceive your restaurant. There may be some common complaints. Is it too loud? Is the service too slow? Is one staff member rude? Restaurant owners can even learn a lot if the reviews are overwhelmingly positive. Are there aspects of your restaurant that customers love? By knowing what those things are, you can make sure you carry on doing what works. 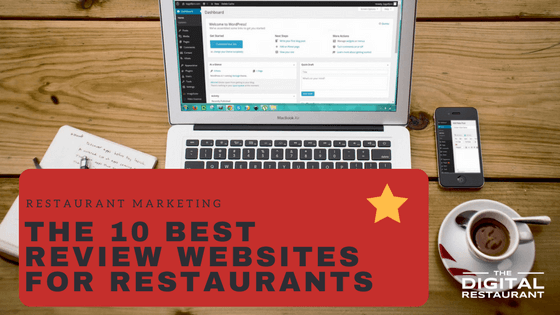 Now you know why managing your restaurant reviews is important, let’s look at the review websites you need to monitor. There may be dozens of review websites out there, but the vast majority of them aren’t used by customers to leave reviews. 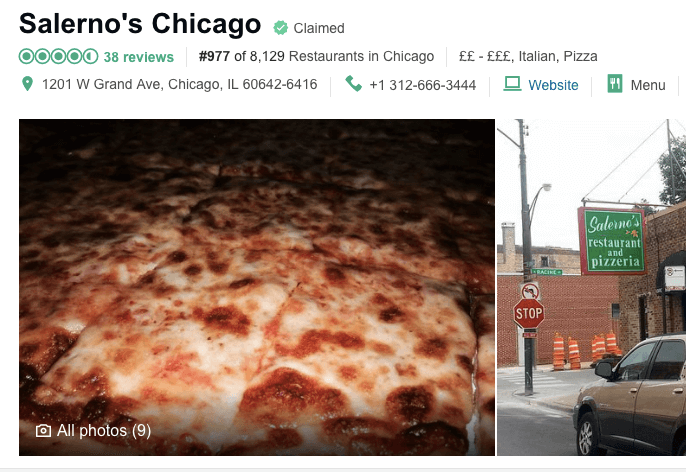 Even more importantly, there are only a handful of sites that come up regularly in Google when you search for “best pizzerias in Chicago” or “top restaurants in New York”. In truth, there are only 4 review websites that restaurant owners and managers need to worry about. 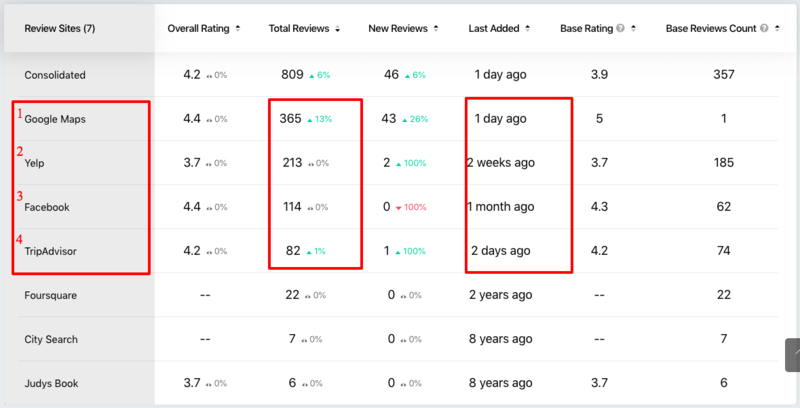 This is based on the number of reviews received on reputation management of NGAGE marketing platform. Some people will tell you Yelp is the most important review website for restaurants, others will tell you it is Tripadvisor. But we think Google is the most important website for restaurants. That’s because Google is usually the first website people turn to when they are trying to find restaurants near them. 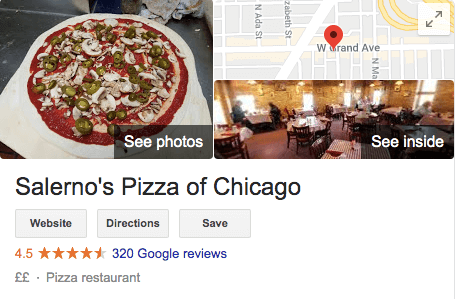 When you type in “Pizza restaurants in Chicago”, Google will serve up a list of at least three options before giving you links to any other website. Those restaurants are the first thing searchers see, which means being listed in them can have a huge impact on business. The number of reviews your restaurant has and the quality of those reviews are two of the major factors Google uses to determine which restaurants appear. That’s why we think its important restaurant owners increase their Google reviews before anything else. Google reviews are managed through your Google My Business account. If you haven’t claimed your restaurant’s listing, do so by clicking this link and then “start now”. If you already have an account, you can log in to view and reply to the reviews you have already received. Yelp is the king of restaurant reviews in the U.S. More people go to Yelp to post a review than any other website. If it wasn’t for the fact that Google displays its own reviews of restaurants before all others, we’d say this is the top review site for restaurant managers to focus on. Everyone in the restaurant business has heard horror stories of fake reviews posted by unscrupulous competitors, but thankfully Yelp is taking more and more steps to stop this. Still, unfair reviews can happen. Think you’ve received an unfair or fake review, read our Yelp guide to find out how you could possibly delete it. You can find out more about Yelp reviews and claim your listing on their website. If you already have an account you can log in here to see your latest reviews. When you think of Facebook, you don’t immediately think of their review system. But it’s there nonetheless. And while it may not be the first stop for diners looking to find a popular restaurant, Facebook can still play an important role in your restaurant’s online reputation. This is especially true, if you are embarking on a social media marketing strategy. Because there’s no point trying to draw people to your social page if one of the things that is waiting for them is a 1-star review rating. While it isn’t as widely used in the US as Yelp, plenty of tourists will turn to TripAdvisor to find a suitable restaurant. That’s not to say locals won’t use it. TripAdvisor is actually becoming more commonly used in this country thanks to a marketing push and a better user experience. If you haven’t claimed your restaurant’s listing on TripAdvisor, you can do so by clicking here. If you’ve already claimed your listing, you can log in to view and respond to your latest reviews. Zomato acquired Urbanspoon in 2015 to cement its place in the US. The India-based company already had a solid presence in other countries around the globe and now it needs to be taken seriously by US restaurant owners, too. Like Yelp and TripAdvisor, the site provides users with much more than just reviews, including images, opening times and menus. Users can even call the restaurant from the site. OpenTable isn’t just used by customers to book a table at your restaurant, they can also use it to read reviews of your establishment, too. Available in virtually every major US cities, as well as around the globe, owners need to make sure they are taking advantage of OpenTable’s reviews and not just it’s online booking program. The Infatuation doesn’t allow for user-generated reviews, but it is still one of the best and most popular ways for diners to choose their next restaurant. Although the service isn’t available in all cities, the super in-depth reports are particularly useful to consumers. If they operate in your city and you’ve yet to be reviewed, it’s worth reaching out to the team. Zagat was one of the first companies ever to start collecting restaurant reviews and it remains one of the most popular today. It was bought by Google in 2011 and now the site’s reviews are tightly integrated into the search giant’s offering. This makes it a practical choice for restaurant owners who want to show up in Google to target. Gayot (named after a French food critic) may not be to everyone’s tastes, nor will it apply to every restaurant. But it is still important for restaurant owners to be aware of this in-depth site. Make sure your restaurant is listed at the very least. Foursquare is a social networking service available for common smartphones. The app’s purpose is to help you discover and share information about businesses and attractions around you. Every time you use it, you share information about the community to your friends. Getting more good reviews of your restaurant can be hard. The truth is that most people are only motivated to write a review when they have a bad experience. This often means your accounts on review websites are not a fair reflection of what your restaurant is actually like. The only way to change this is to encourage more customers to leave positive reviews. The best way to do this is to either ask them or incentivize them. 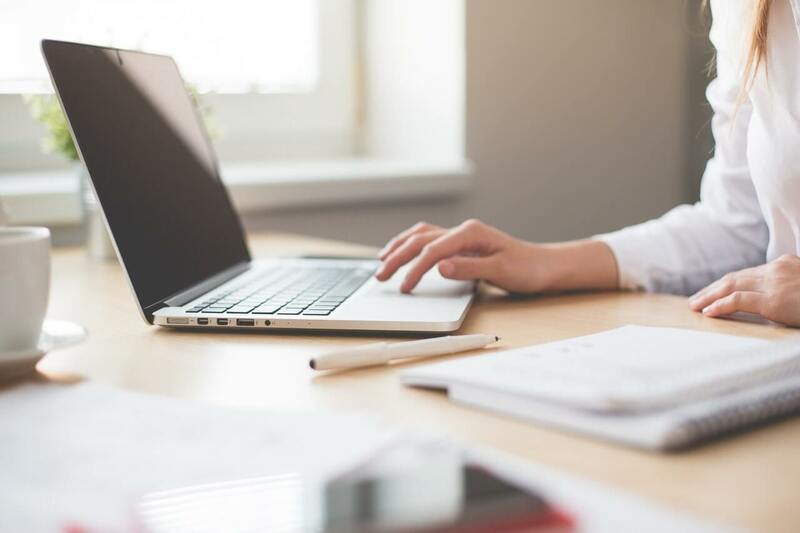 If you tell your customers how much a good review means and what it does for the business, they will be much more likely to go out of their way and leave a review. People really do want to be nice and help each other out. If that doesn’t work or you really want to go all out, you can try to incentivize customers to leave a review. This can be as simple as giving them a business card complete with all of the details they need to leave a review. Or it could be offering them a discount on their next visit or a free drink. Be careful, however, as paying people to write reviews and even some other forms of incentives are against the terms and conditions of sites like Yelp. If you need help getting started with review sites, make sure to check out our guide to reputation management. We also provide a bespoke service that will see us manage your online reviews and reputation on your behalf. Get in touch today to find out more.